With the news that Keiji Nakazawa has passed away, I reprint here an interview I did with him for NEO magazine a few years back. “I haven’t been successful at all,” says Keiji Nakazawa, with customary Japanese self-deprecation. “Human beings are really stupid.” His complaint is with governments who continue to support war as a means of resolving disputes, be it conventional, biological or nuclear. As a boy who witnessed atomic destruction in person, he’s made it his mission in life to stop it happening again. He was born in 1939, in Hiroshima. He was six years old when the atom bomb was dropped on the city, and somehow survived the appalling conditions of the aftermath. Information on radiation and its effects were classified and denied during the Allied Occupation. Those who had experienced Hiroshima and Nagasaki learned to keep their origins secret, for fear that other Japanese would discriminate against them. Official recognition did not come until Nakazawa was a teenager. A Japanese fishing boat, the Lucky Dragon V, was hit by fall-out from one of the post-war American bomb tests on Bikini Atoll. Initial Japanese anger focussed on the exclusion zone around the test site, widely believed to be an attempt to interfere with Japanese tuna fishing rights. Then, one of the fisherman died as a result of his injuries. In paying compensation to his widow, the American government admitted that there were side-effects from atomic weapons. The people of Hiroshima and Nagasaki were not malingerers or ambulance-chasers, as they had previously been painted; many of them were genuinely still suffering the lingering after-effects of radiation, and would continue to do so for the rest of their lives. The idea of a radioactive monster eating at the heart of post-war Japan would inspire an icon of the local film industry – Godzilla. The Japanese government eventually answered the problem in the real world with new legislation, the Atomic Bomb Victim Medical Care Law of 1957, granting free hospital care to the victims – the hibakusha. Just as in everyday life, he kept talk of Hiroshima out of his manga. That all changed in 1966, when he rushed back home for his mother’s funeral. Although it is usual to find shards of bone in cremated human ashes, Nakazawa saw none at all, and described the discovery as a chilling revelation that “the radiation had even invaded her skeleton.” Clutching her ashes on the train back to Tokyo, he realised he couldn’t keep quiet any longer. Back in the city, he risked a pariah status by openly discussing his experience of the bomb, with the first of his “Black” series, Beneath the Black Rain. Nakazawa began trying to sell more stories about Hiroshima, but ran into difficulties. It was the height of the Cold War and shortly after student demonstrations over Japan’s Security Treaty with the US. There was revolution in the air, and the same images of riots and street protests would also feature in another well-known manga, Akira, drawn by another arrival in Tokyo, Katsuhiro Otomo. Large magazines had previously refused to publish Nakazawa’s Hiroshima tales, afraid of finding themselves on a mythical CIA blacklist. Now that Japan was an “unsinkable aircraft carrier” for America, Nakazawa feared that it might be subject to a nuclear attack, and resolved to continue retelling his life story, both of the Bomb and, more crucially, the prejudices and hardships of its aftermath. The resulting family saga was not completed until 1987. Later volumes detail the attempts of the survivors to stay alive in the ruins, surrounded by the mortally injured and the permanently disfigured, as starvation sets in and the war stumbles to a close. Told in a squat, cartoony style popular in comics of the 1970s, the horrors of the war seem all the more shocking when presented in a “children’s” format. Unlike most of the manga that run in Shonen Jump today, Barefoot Gen was genuinely educational, and served to teach an entire generation about the conflict. A group of Americans, including Jared Cook and future Manga! Manga! author Frederik L. Schodt, acquired Japanese copies of Barefoot Gen in the 1970s, and began the “Project Gen” charity to translate it for a Western audience. Thanks to their efforts, the comic became the first manga to be published in English, and soon made its way into many other foreign languages. 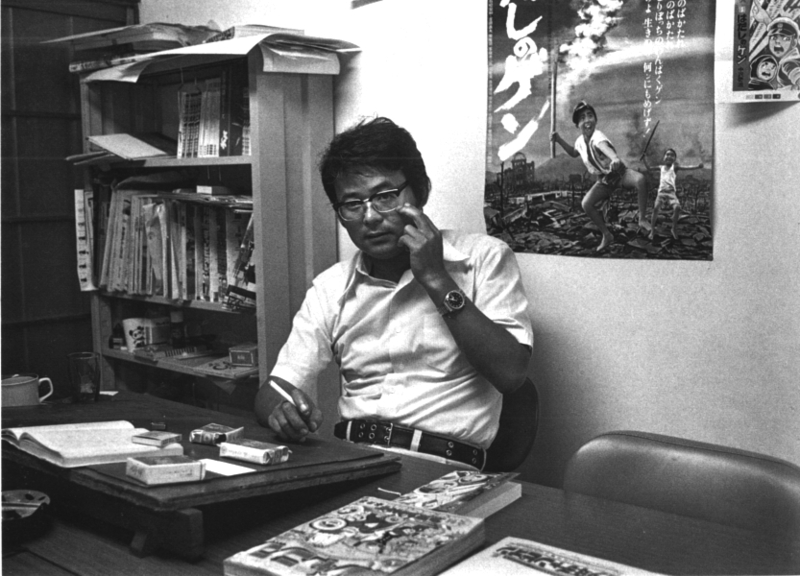 What distinguishes Barefoot Gen from its many imitators is Nakazawa’s even-handed approach. Unlike many other Japanese writers about the war, he is prepared to deal with Japan’s military role objectively. He is unafraid of mentioning that Japan started the war, or that many of the common people were duped by a military-industrial complex into fighting a war they couldn’t win. The Americans don’t drop the Bomb on Hiroshima until 250 pages into the first volume of Barefoot Gen, giving Nakazawa plenty of time to present the event in its historical context, and to catalogue the motivations of both Japanese war-mongers and pacifists. Nakazawa seems able to do this because he has little interest in assigning blame for the war. He genuinely believes that it is the Bomb itself that is evil, and concentrates his anger on chronicling its terrifying after-effects, which are with the Japanese to this day. “I think they understand the message,” says Nakazawa. “In the places where US bases exist, such as Okinawa, the feeling against Americans still seems stronger.” But elsewhere, he feels, he gets his ideas across. The story was also adopted into live-action films (the first of which won Best Screenplay at the Czech Film Festival in 1977) and two animated versions. For a whole generation, Japanese animators had avoided discussion of the war, instead allegorising it in space adventures or alien invasions. Barefoot Gen the anime rode a wave of change inspired by an exhibition in Tokyo about the life and famous diary of Anne Frank. An Anne Frank anime followed in 1979, establishing a new sub-genre within anime: war films about children, in which Japan’s baby-boomers cast themselves as a blameless generation, forced to endure the consequences of their parents’ martial past. After the success of Barefoot Gen in 1983, other animated works appeared, many of them similarly autobiographical and child-centred. These ranged from Isao Takahata’s masterpiece about the fire-bombing of Kobe, Grave of the Fireflies (1988), to less polished TV movies such as Toshio Hirata’s Rail of the Star (1993), depicting a Japanese colonial family’s desperate rush to reach American-occupied South Korea. Almost every major city in Japan seemed to gain a personalised film about the horrors of WW2, but many of Barefoot Gen’s imitators used youthful protagonists to present the Japanese as innocent victims. This played well at home, but also into the midst of the ‘textbook controversy’, a long-running debate over the selective information imparted about WW2 to Japanese schoolchildren. Nakazawa is known as the manga chronicler of Hiroshima, and the large part of his work deals, directly or indirectly, with the Bomb. His lesser known comics include Beneath the Black Rain (animated 1984). The original focussed on a Bomb victim who is tried for murdering an American black marketer. The anime concentrates on the plight of Hiroshima’s women, with one character who avenges herself on Americans by giving them syphilis, another who uses her scarred body as a “living museum” to show the Bomb’s effects, and a third who frets over whether she will have a disabled baby. Other stories help illustrate Nakazawa’s over-arching theme, often overlooked in surveys of his achievement – the triumph of the human spirit in the face of adversity. Examples of this aspect of his work includes Fly On Dreamers (animated 1994) about a group of war orphans who get to play against the Hiroshima Carp baseball team, and The Summer with Kuro (animated 1990) in which two Hiroshima children befriend a black cat. His most recent manga work is Okonomi Ha-chan, a tale of a Hiroshima bad boy who tries to reform his ways as a short-order cook, and finds love into the bargain. When Nakazawa talks about Okonomi Ha-chan, he sounds as if he is trying to lay another element of his past to rest, as if the war has dominated enough of his work, and it is time to move on. It was turned into a live-action film in 1999, with Nakazawa writing and directing, a change in career direction that he seems keen to pursue in his later years. For Nakazawa, working in a new medium only requires a small change in his working habits. He has a reputation for telling things as they are. As an artist, as a writer, and as a director, he has a simple rule for getting his message across. This entry was posted in News and tagged Barefoot Gen, Keiji Nakazawa, obits by ixarette. Bookmark the permalink.